We create a customized mobile experience that allows you to connect with your customers wherever they are and provide them with the content they’re looking for whenever they need it. While responsive websites are great, well-designed apps are proven to create a personal user experience tailored to each individual customer. Mobile is bigger now more than ever before with users spending up to an alarming average of 5 hours per day on the their mobile devices. So the question is, are you harnessing the power of mobile innovation? It is imperative for every business to have a website and have that website be mobile. But to take it a step further and really create the ultimate user experience for you customer, nearly every business should develop their own app. You make think an app isn’t answer for your business, but even the most professional of enterprise services can create an app that gives a greater user experience. The acceleration of mobile usage by consumers to support their daily life is creating a demand for companies to develop new solutions offered in the form of responsive design and app development. The question all businesses are facing is should they be providing their customers with solutions through responsive websites, mobile apps or even both solutions? Mobile Apps provide a more personal user experience that allows your users to customize settings and content to connect with friends or colleagues, share content or interact with a business through this more personalized user experience. Whereas responsive websites allow the same website that displays on a desktop to render to the screen size of the device that your user is searching from whether it is a smartphone, tablet or wearable watch. Responsive websites fit all devices and screens Mobile apps are developed specifically for mobile devices and are easier and faster to use. Responsive sites must be optimized for computer and mobile design The app doesn’t need to be optimized differently for tablets versus phones. Your company’s link equity is preserved with responsive design because new code is simply embedded on the back-end of your primary website Mobile apps requires updates not only to correct bugs on your app, but also when new software updates roll out. Any changes and enhancement updates made to responsive websites will propagate across any device The app may open up a browser page, but it is on a mobile browser. 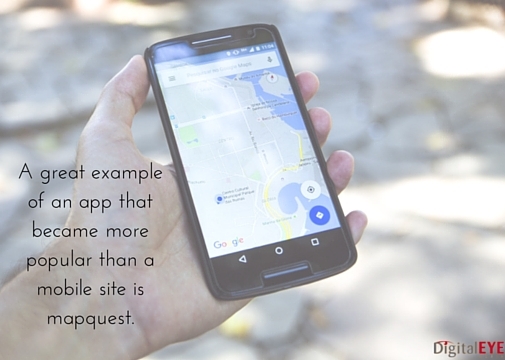 Links shared from mobile browsers don’t count as search link equity toward your primary site which might have implications for your SEO strategy. How Will Mobile Phone Apps Benefit Your Business? Since customers use both mobile apps and responsive website in their daily lives, it’s important for your businesses to analyze your target audience before deciding which is the right solution for you. Let Digital EYE guide you and help choose the best option for your business. It doesn’t matter what mobile device your customers are using or how they’re digesting their content, Digital EYE works with you to design a mobile experience that’s perfect for your business and your users. Is An App the Answer for Your Business? The truth is, some really well made apps can provide a much better user experience than even some of the best websites out there. Interactivity – Keep your customers engaged, incorporate easy social sharing and implement an easy way to inform them of new functionality updates they might be interested in. Personalization – Gather data to complete user profiles and syndicate content or offers to similar audience groups. Success through personalization is of the most important ways to create an amazing user experience. Target More Users – Your customers are using a variety of channels on the web so an app that has cross channel functionality allows you to manage and nurture your relationship with your customers across multiple platforms and devices. Better Customer Support – Deliver high-quality support to your customers instantly and more efficiently. Gather Customer Feedback and Data – Learn more about how your customers are using your products and services to understand what they do and don’t like. Mobile App Marketing Strategy –Step-by-step marketing plan including new user acquisition, promotion and optimization strategies pre, during and post launch. Mobile App Monetization –Competitor analysis and app performance metrics to develop revenue generation ideas. User Acquisition –Scalable marketing lifecycle for higher lifetime value (LTV) app users including mobile video, social media, media buying and influencer partner referrals. 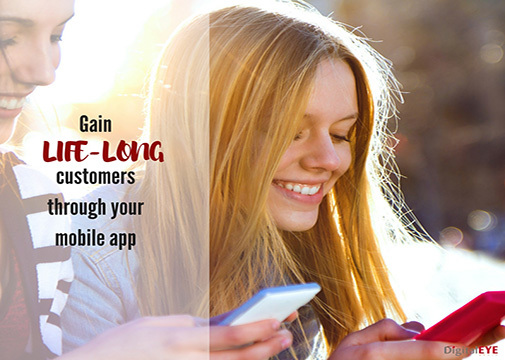 App Store Optimization –Increased visibility with highly targeted, SEO optimized content tailored for your customers and optimized for higher conversions. Re-engagement– Identify your users and bring them back to your app by deep linking to specific content and events inside your app. Analytics – Utilizing conversion tracking tools to determine what referral sources are driving the greatest amount of app installs and quality users post download. Drive Your Mobile User Acquisition Globally to Achieve What No Other Company Has Before! 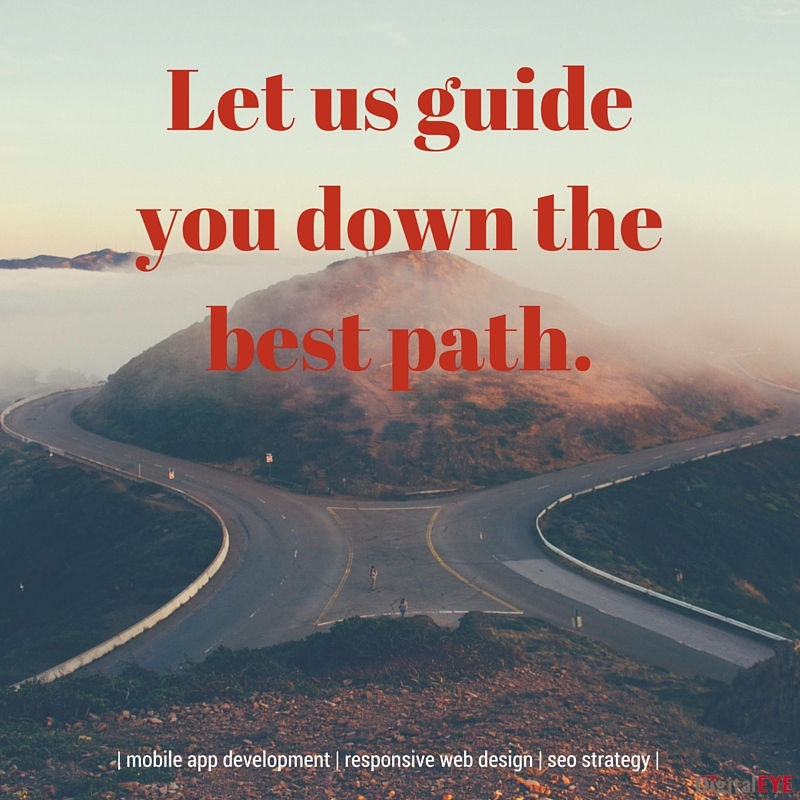 We develop a campaign road map that starts with fulfilling a need with a comprehensive app idea and marketing strategy. We then deploy an industry-leading app design, custom user experience, innovative development and continue with ongoing digital marketing to drive new customers to become engaged users of your app. The team at Digital EYE Media is dedicated to partnering with your business to create a robust mobile app strategy that helps bring your app to life from an initial drawing board concept to the hands of your new customers. We pride ourselves in building cutting-edge mobile apps that create value for our customers, that are loved by users. Our design-savvy experts will walk you through the entire app development process. 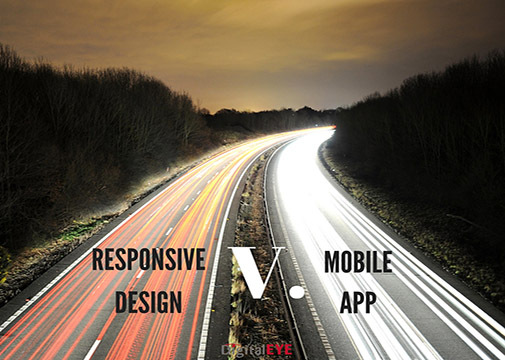 Contact Digital EYE to find out how we can increase your ROI with custom app development!